Nature viewing in Missouri can be as close as your backyard or neighborhood park, but conservation areas and natural areas are excellent places to spend time in nature. Take a driving tour, hike though a forest or glade, or just sit and listen to the sounds of nature. As the days get longer and the sun warms the air, people come out to enjoy the spring season. But, people are not the only things that “come to life” when spring arrives. Spring plants unfold their leaves and work to bear fruit. The staff at Twin Pines is taking advantage of that bounty with a class on how to prepare foods, such as, wild strawberries and sassafras for your table. Other wild plants will also be used depending upon availability. This program is for ages 16 and up. Under 18 must have a parent or guardian present. To make a reservation, call 888-283-0364 or register on-line at www.mdc.mo.gov/twinpines. For further information, call 573-325-1381. Everyone loves flowers and spring is a great time to see them. Join us for a program and short hike (weather permitting) as we learn what special jobs flowers do. We will complete a flowery craft to take home. Please no organized groups. Ages 3-6. There are many smartphone apps available to help identify plants and animals, track your sightings, and learn more about the outdoors. Get an introductory lesson in outdoor smartphone apps and be better prepared for your next outdoor activity. All ages. Come enjoy a naturalist lead hike at two of Missouri’s beautiful natural areas in honor of National Trails Day! We’ll see waterfalls, unique rock features, and interesting plants along the way. Hike is 3.5 miles and rated moderate. Ages 12-17 with adult supervision. Pick this option if you are following us from the Nature Center or meeting us there. Must dress appropriately for the weather and must wear sturdy shoes. Please bring water, lunch, and any comfort items (insect repellant, hat, binoculars, sunscreen, etc.). Will be canceled if severe weather is in the area. Come enjoy a naturalist lead hike at two of Missouri’s beautiful natural areas in honor of National Trails Day! We’ll see waterfalls, unique rock features, and interesting plants along the way. Hike is 3.5 miles and rated moderate. Ages 12-17 with adult supervision. Pick this option if you are riding with us from the Nature Center. Must dress appropriately for the weather and must wear sturdy shoes. Please bring water, lunch, and any comfort items (insect repellant, hat, binoculars, sunscreen, etc.). Will be canceled if severe weather is in the area. Spend a couple of hours hiking and testing your nature knowledge to celebrate National Trails Day! Trek our trails and answer nature-related questions along the way. Stop by the nature center between 9-4 to pick up your question sheet and then return to check your answers and claim your prize. Youth and adult groups welcome. Help your family be prepared for safe outings this summer by learning how “an ounce of prevention” before an outdoor excursion can prevent needing “a pound of cure” afterwards. Learn how to identify and avoid various poisonous plants and venomous animals and the best way to deal with ticks, mosquitoes, and more. The prairie is home to a wide variety of plants, animals, birds and insects. With that in mind, the Pine Needlers ninth block for a themed quilt now focuses on the meadow lark. A robin-sized bird with a bright yellow breast marked with a black V, this bird is best known for its call. So join the Twin Pines staff and learn more about this favorite prairie resident. This program is designed for ages 16 and up. Under 18 must have a parent or guardian present. To make a reservation, call 888-283-0364 or register on-line at www.mdc.mo.gov/twinpines. For further information, you can call 573-325-1381. Ever wonder what it takes to keep all the nature center reptiles, amphibians, and fish happy? Thanks to some amazing animal care volunteers, they are fed a delicious smorgasbord of crickets, worms, minnows, and more! Drop by to visit with the volunteers and staff as they feed the hungry critters. Youth and adult groups welcome. Discover what’s for dinner at Burr Oak Woods as the captive snakes are fed every other week (June 7 & 21). If you enjoy being creative and all things rustic, what better way to add a special piece to your home than to put it together yourself. Join Twin Pines volunteer, Linda Strauch and make a broom using sassafras and native grasses common to the Missouri Ozarks. Materials are provided. This program is designed for ages 16 and up. Under 18 must have a parent or guardian present. Make a reservation by calling 888-283-0364 or register on-line at www.mdc.mo.gov/twinpines. For further information, call 573-325-1381. Registration required (ages 9-12) Before and after care available beginning at 7:30 a.m. and ending at 5:30 p.m. Camp and extended care are both free of charge. Becoming an urban xplorer is as simple as taking a step outdoors. In our summer camp you will xplor the wonders of nature by learning outdoor skills, visiting an urban cultural site and utilizing nature within art. Field trips will be a part of your xploring, You will get to canoe, fish, hike and xplor a stream. Make plans now to become an urban xplorer this summer. Applications will be available April 1 at the Discovery Center and on our website, https://mdc.mo.gov/discoverycenter. Applications will be accepted through April 22. Applicants will be notified of acceptance by May 1. Partial funding for this program comes from Missouri Parks Association's "Urban Populations Outreach Program." 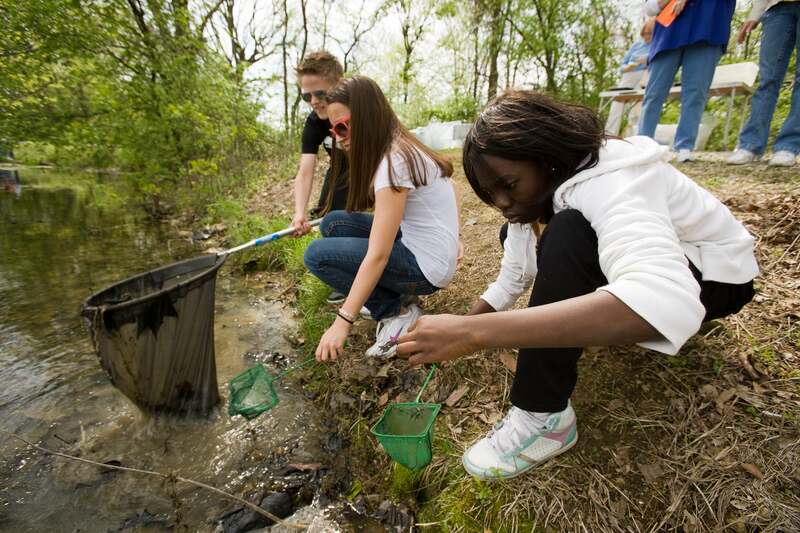 From tiny trickling streams to the mighty Mississippi, this year’s camp highlights southeast Missouri’s aquatic habitats. Get wet as we find out who lives where and why.